Making it easy to reproduce end-user issues and bugs with Flux. Troubleshooting applications running in production is not always easy. You might get bug reports like "Nothing works!" In addition, some errors might only occur based on the data that the user is working with, and reproducing the issue could be challenging because of specific dependencies (e.g., user, API) … the list goes on and on! There are plenty of tools available out there that can catch any errors with a stack trace and very detailed information, but even then the error might be hard to reproduce. In this blog post, we'll show how you can leverage your existing React and Flux infrastructure in order to have a better logging and debugging experience. 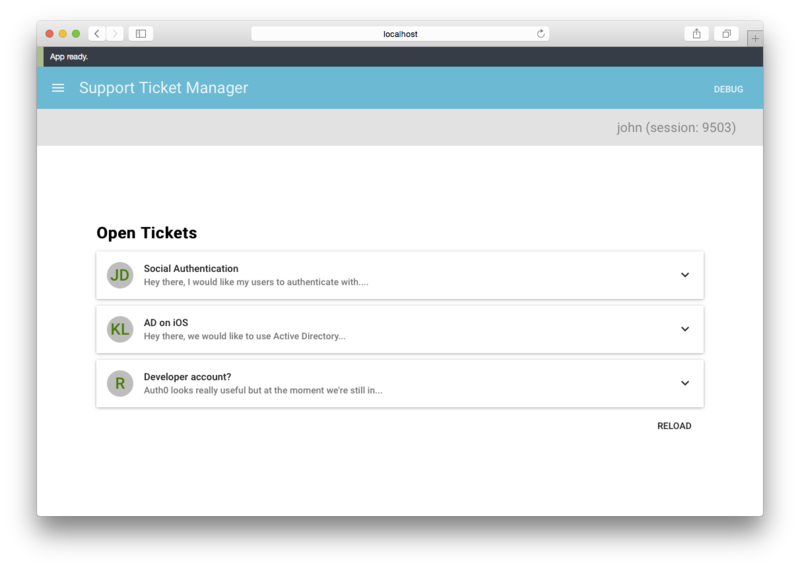 The example in this blog post is a customer service application that allows you to manage open tickets. You can view the open tickets and close tickets that have been resolved. John, an end user, is solving the open tickets and closing them one by one. But suddenly... a crash! So John goes ahead and opens a bug: "Nothing works!" Jane, a developer, is now assigned to work on the "Nothing works!" bug. Great. Luckily, their application is recording all Flux actions executed by users. These actions are linked to a user's session, so she can just go ahead and look for John's session. After that, she can replay John's session and try to figure out the problem. Aha! While replaying John's session, an error pops up in the developer console. It looks like there might be a bug in the Error.jsx component. // Export the dispatch method. "Actions are dispatched to stores, and stores will notify components to update themselves." The message will first be logged to the console. This could be something you want to activate for your non-production builds. Then, if the user is logged in and it's not a "debug action", the data is posted to the back-end. When we replay actions in a troubleshooting session, we'll mark these as "debug actions" to make sure that these actions are not sent to the server again. // Replay all actions with a delay. When replaying a session, we'll first dispatch the RESET and the START_DEBUG actions. The RESET action can be handled by all stores to reset their state (clear all data, clear alerts, etc.). The START_DEBUG action tells the rest of the applications that we are now going to replay certain actions. This is very important because one thing we'll want to avoid is our application making calls to the API. So our HttpClient will not be making calls during this time (in the next section, we'll explain how this works and how we're leveraging Flux to record every request and every response so we can replay everything later without requiring interaction with the API). Then we go over each action and dispatch it, after which we introduce a small delay. As a result, the developer will see every action that is replayed (in fast-forward, as the delay is always 250ms). And finally, the STOP_DEBUG action is sent to notify that we're done replaying the actions, which re-enables the HttpClient. When Jane was debugging John's session, we immediately noticed a bug in one of our components, so this approach is good to catch runtime errors. But what about API calls? When replaying the actions, the HttpClient will not be making any calls to our API, so how can we effectively replay and troubleshoot API calls? Well, we'll just need to dispatch an action each time we want to make a request, each time we get a successful response, and each time the API returns an error. When the request is successfully executed, we can dispatch the result. This class will dispatch YOUR_ACTION before the call is made to the API. Then, it will dispatch YOUR_ACTION_SUCCESS when the request has been executed or YOUR_ACTION_FAILED in the event of an error. This means that every request and response is dispatched and also being logged to our back-end. Thus, we can easily replay all actions, including the data returned by possible API calls, without having to interact with the actual API. This is useful if you need to reproduce an issue that occurred a few days ago for which the data might no longer exist or might have changed. The complete source of this application is available on GitHub: https://github.com/auth0/react-flux-debug-actions-sample. Follow the instructions here to start the front-end and the back-end.